Photographer Peter Stewart is an internationally published photographer who’s also popular on photo sharing sites, boasting tens of thousands of followers and millions of views on 500px, Flickr, and Instagram. 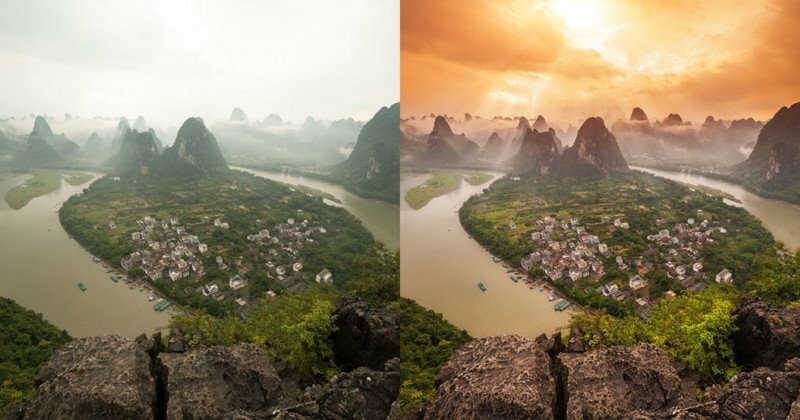 Here’s an eye-opening series of his before-and-after post-processing comparisons. These images show Stewart’s original photo as it appeared straight-out-of-camera, some intermediate views at various stages of editing, and the finished photo that’s published by Stewart across his channels. 3x exposure edit. 2x exposures manually blended in Photoshop. Perspective fixed in CameraRAW. Color adjustments made using Nik Color Efex Pro and VSCO. Replacement sky composited into final image. Single exposure edit. Overexposed image with detail brought back using camera raw. Nik Color Efex Pro used for post-production color and contrast enhancements. 3x exposure edit. HDR bracketing manually blended in Photoshop. Nik Color Efex Pro used for post-production color enhancements. 3x HDR exposure edit + Sky replacement layer. 3x exposures manually composited in Photoshop CC. Replacement sky layer manually overlaid and ‘painted’ in.